This artist's concept shows a sample of Martian rocks and soil blasting off the Red Planet's surface, destined for scientists' labs here on Earth. Over the next few months, NASA will map out a strategy for returning bits of Martian rock and soil to Earth, so scientists can study them for signs of past Red Planet life. That ambitious goal should drive the space agency's next steps at Mars, according to a report released Tuesday (Sept. 25) by the Mars Program Planning Group. The report also lays out several ways Mars sample-return can be accomplished over the next decade or two, and NASA is reviewing those options now. The agency may reveal its chosen path in February, after the White House releases its federal budget request for fiscal year 2014, NASA officials said Tuesday. In the meantime, here's a brief rundown of the scenarios they're looking at. All the major options proposed by the Mars planning group share three basic components in common: a sampling rover, a Mars Ascent Vehicle (MAV) for blasting the collected rock and soil off the Red Planet surface and a return orbiter, which will snag the samples in space and ferry them to Earth's neighborhood. This strategy has the advantage of spreading costs and technical challenges across three missions — which could each be at least two years apart, since Mars launch windows come about every 26 months — according to the planning group report. Another option is to consolidate into two launches. The sampling rover would ride alone, while another liftoff would carry the MAV, fetch rover and return orbiter. In this case, the orbiter would likely have to be powered by solar electic propulsion (SEP), to cut down on weight. The amount of liquid propellant needed for a traditionally powered spacecraft would be quite heavy. 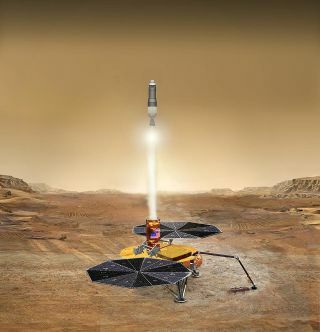 This artist's concept shows a rendezvous in Mars orbit between a small container holding Red Planet samples and a vehicle that will fly them back to Earth. Alternatively, all the pieces needed for Mars sample-return could be lofted in a single shot, the report says. In this case, the sampling rover would carry an integrated MAV with it, eliminating the need for a fetch rover. Again, the return orbiter would be an SEP craft, which creates thrust by accelerating electrically charged atoms or molecules. The single-launch option would eliminate some mission complexities, such as coordinating the meetup of samples with the MAV. And it would reduce the project's overall cost by cutting out a launch or two. But this scenario has the highest peak-year costs, the report states. "They all have their pluses and minuses," Orlando Figueroa, team leader of the Mars Program Planning Group, said of the 1-, 2- and 3-launch options. "It gives you multiple ways to look at this problem, consistent with budget concerns, consistent with opportunities for collaboration, more technology, et cetera," Figueroa told reporters Tuesday. "And that's what we tried to do — bring all of those options forth to NASA for consideration." The above options assume that NASA will pick suitable sampling sites using existing data. But the MPPG report also outlines a path that allows for more on-the-ground research, which some scientists may feel is warranted for such an ambitious and expensive project. If NASA chooses this course, multiple rovers would be sent to investigate several different sites. Based on the rovers' findings, scientists would eventually select one site for sample return. Mars material would be delivered to Earth via an MAV and return orbiter, as discussed above. Multiple rovers would incur greater costs, but building identical robots off a production line could help keep the price tag down, the report says. In 2010, President Barack Obama charged NASA with getting astronauts to the vicinity of Mars by the mid-2030s. The space agency thinks this goal dovetails nicely with its sample-return ambitions, and it sees plenty of room for collaboration between its robotic and human exploration programs in this arena. For example, astronauts aboard NASA's Orion capsule — which is still under development — might be dispatched to intercept the return orbiter in deep space and bring the Mars samples down to Earth, officials said Tuesday. This approach would eliminate the need to harden the sample capsule for Earth entry, since it would land aboard Orion. And an astronaut inspection would also help ensure the Mars sample is adequately contained, officials said. "It is taking advantage of the human architecture, because we anticipate it will be there," said John Grunsfeld, associate administrator for NASA’s Science Mission Directorate. "And it potentially solves an issue of, when we return samples, somewhere we have to make sure that the samples are completely contained so there's no chance — remote as it may be — that there is something on Mars that could contaminate Earth," he added. NASA is hoping to launch its first piece of the Mars sample-return architecture in 2018 or 2020, Grunsfeld said. The agency has just $800 million or so to work with until then — too little for a rover, so NASA will likely launch an orbiter if it chooses the 2018 opportunity, Figueroa said. But just when pristine little pieces of the Red Planet could make their way to Earth — and into scientists' labs — remains very much up in the air. "As far as time frame — that's all forward work, to figure out," Grunsfeld said.